It's been a while since I talked about my own beers on here, so I thought I'd give a bit of an update on the beers I have aging. For context, and as an excuse on why my brewing hasn't made more of an appearance, I spent Sept 2015-May 2016 living in Europe (my second ~8 month stretch working in Europe in the last 3 years). I wanted a bunch of beers for long term aging and blending, and these trips gave me a good excuse to stash some beers to come back to at a later date. For both of these trips, I stored these beers (along with a bunch of bottled beer) in the basement of my very kind friend Mark. when they got oak, and quick tasting notes. The Beers: To start this off I should note the beers that I have. Most of the beers are lambic-inspired (turbid mashed, brewed with ~30-40% unmalted wheat and ~60-70% malted barley, using aged hops, open cooled). Some of these are fermented only with local ambient microbes (from either starters of local ambient microbes or only from what the wort got during open cooling) but most have dregs and/or commercial cultures on top of the inoculation from open cooling and ambient starters. -Barrel Aged Old Ale: This beer (brewed 5-Oct-2014) is discussed in detail in this blog post. I still have ~5.5 gallons remaining in carboys from my 10 gallon share of a 30 gallon oak barrel. It seems this beer was put on a very small amount of raspberries, though unfortunately I don't have any details on how much/when/anything else (at the time this would have happened, I was scrambling to get ready to move and my notes were's up to my standard). The raspberry level is very low and not necessarily identifiable if you weren't looking for them. Brief tasting notes (Tasting): This is tasting pretty good (nice dark malt, good mellow barrel, light alcohol, mild acidity, good Brett C, some fruityness) but possibly not as good as the portions that I bottled in summer 2015 shortly after it came out of a barrel instead of bulk aging further in a carboy. 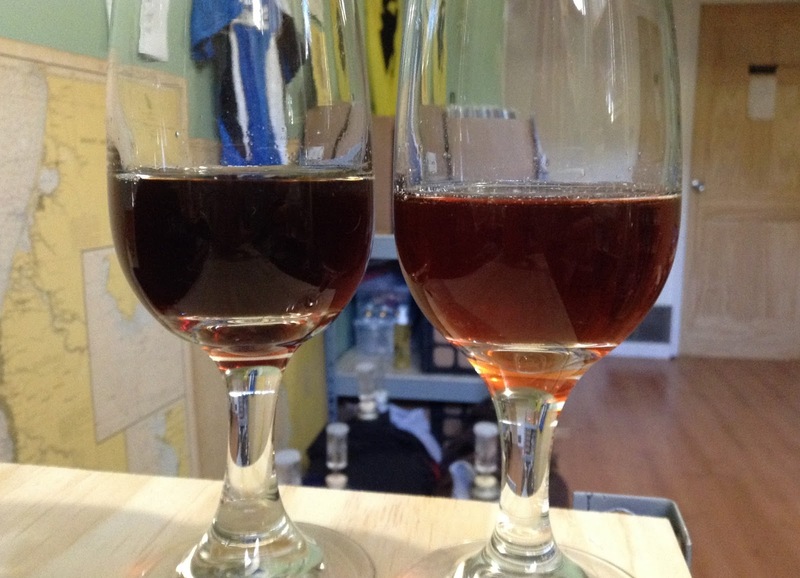 Barrel old ale (L) and Raspberry Dark Session (R). Blending Plans: I expect most of this beer will be blended with the low strength dark beer below. I'm not sure what I'll do with the rest. Probably either bottle plain or brew a lower strength younger beer to blend toward an oud bruin-oriented end (though of course this aged component is fairly strong). I will also have a Flanders red-inspired beer coming out of a barrel soon so some of this could find its way into that beer. -Dark Session on Raspberries: This was extra wort from a dark mild (brewed 8-Feb-2015) and was a subsequent batch of a recipe similar to this beer. I had about 3 gallons that I added a mixed culture to and then, after a few months, racked onto the leftover raspberries and blend from Blend 4. (L to R: 33/67, 47/53, 67/33 Session/Old). Tasting: The acidity is forward (makes sense with the lower hopping) and there is a mellow touch of acetic but not to an obtrusive degree. It is a bit too thin overall - not surprising given the OG of 1.038 - but I think it could make a good blending component. The raspberry level is good and there is a cool chocolate raspberry thing going on. Blending plans: I figure almost all of this beer will be blended with the barrel aged old ale to come out with an end beer of a more reasonable gravity between the two components while preserving the dark malt and fruit combination. Some extra, if any is left over, may make it's way into other beers to increase the fruityness. But only if those beers also could benefit from an increased acidity. I did some quick blending trials with this beer and the old ale. The winning ratio was about 45/55 to 40/60 session/old. -Dark Strong Mixed Culture: This beer (brewed 5-Aug-2013) was inspired by Oerbier Reserva. The goal was something red wine-like with a mild-medium acidity and that I could have around for a while. The OG was around 1.080, with a sugar feeding during fermentation of dark candi syrup. Tasting: The beer is pleasant and the acidity is there (maybe even slightly on the high side for my target of a more mild acidity, but ok) but it isn't quite there. I think much of the problem is that, unlike Oerbier Reserva, this was not aged in a red wine barrel. So I am not getting the wine-like character that I was looking for and I am not getting the oak. I added a bit of oak after tasting (not first use oak, and after soaking in boiling water). Blending Plans: I think it could be likely that I'll end up blending at least some of this with a red wine to approach the character I am looking for. If so I'll probably choose something a bit lower in tannins and ABV and higher n fruityness. This beer is ready for those test blends with wine whenever I get around to it. Having Rodenbach's Vin de Céréale in 2011. -Strong Flemish-Inspired mixed culture: This beer (brewed 26-Oct-14) was inspired by Rodenbach's Vin de Céréale. I've had the pleasure of having this beer a couple times and it is amazing to me. Flanders red-like in character but strong and pale for the strength, age, and the general Rodenbach lineup. Tasting: I didn't expect to actually hit my target on the first try, but I am a bit bummed about how far off I was. The beer is not bad, but it was not the goal. I think what the beer is lacking is a combination of fruity flavor and oak, and possibly a bit of oxidation. It is more malty and dry/toasty instead of fruity. Part of this may have been my choice of malt (100% Vienna, rather than pils and some darker malts for the same color). Blending plans: This is another beers that may see some blending with wine. It may also see some blending with the 1/3 share of a Flanders red-inspired beer I have had in a 30 gallon oak barrel for about 13 months now. I could also try to encourage more fruityness by the actual addition of fruit, but if so that will only be a small portion as I want this beer to be around for a while and I don't want to heavily fruit something only to let the fruit fall away before I have even half of the beer. The Dec 2014 Spontaneous Starters carboy. -December 2014 brew: This beer was brewed with 30% unmalted wheat and 570 g/HL (0.76 oz/gal) aged hops. The batch was split into 3* 6 gal / 23 L carboys. One was pitched with ambient microbe starters, one with various bottle dregs of multiple spontaneous beers, and another with ECY-20. Tasting: The spontaneous starters carboy is quite bitter and phenolic. This needs some time to mellow out. I think it has a good chance of doing that as younger lambic/spontaneous beer can have similar characteristics. The ECY-20 carboy is sweeter with more fruit but also quite bitter. It is possible that some of this is coming from the hopping rate, which might be a bit high. But I think a fair amount of it is also brett-derived. I added some more cultures (from the yeast cakes from previous good turbid mashed homebrews) to this batch. The dregs carboy more acidic, has more citric fruit, and less bitterness/phenol. This is closer to being ready for blending but I still find it a bit more bitter than ideal. -May 2015 brew: This was brewed with 41% unmalted wheat and hopped at about 600 g/HL (0.80 oz/gal). The batch (60 L) was split into 4 carboys which were pitched with either lambic dregs, spontaneous starters, ECY-20 or left to ferment with only what it got from open cooling. The May 2015 Fully Spontaneous carboy. Tasting and Blending Plans: The ECY-20 batch us nicely fruity (citric mostly) and has a more balanced level of phenols. This I think could be ready to blend soon, or I may wait on it if I am not coming up with a blend that I'm happy with. The dregs carboy is more fruit balanced and with lower phenols than the ECY-20 batch. It has a bit more acidity (possibly slightly on the high side of what I want, or at least I don't want much more) but the acidity is clean/not acetic. This is another carboy that could be incorporated into a blend soon if I come up with something I like. The spontaneous starters batch has more bitterness than others of this brew, but lower than the Dec 2014 and Sept 2015 brews. Overall this is pretty mellow yet, with a low level of sulfur and some lower fruityness and acidity. Perhaps not surprisingly, my ambient microbes may need a bit more time to develop the same sort of character intensity as lambic dregs or lab blends. The fully spontaneous batch had more astringency/phenolic bitterness and a pleasant soft tropical fruit. I'm not too worried about the phenols at this point as spontaneous beer producers have anecdotally noted that their younger beers can be pretty rough in this regard and it mellows with time. So I'll wait this out for a bit. -June 2015 brew: (this is even more true for the following brew) I know brewing in warmer months breaks from tradition for lambic. The reasoning given here being that unwanted microbes are more populous in warmer weather and the beer will head in a non-ideal direction. Another factor, which isn't discussed as much but which I think is quite important, is that warmer temperatures are insufficient to properly cool a commercial sized batch in a coolship to pitching temp (in the ballpark of the high teens C / mid 60s F). So I wanted to try warmer month open cooling out for a couple reasons. First, the weather wasn't too warm (nights near 10 C / low 50s F). This was sufficient to cool my volume of wort to the same sort of temperatures that a commercial batch of lambic is cooled to in winter. Second, most of these beers were pitched with something, which means I am less reliant and inoculation from cooling. And finally, a batch are two aren't much to dump if it turns out that the warm weather microbes are a problem. So I will see if the summer microbes and microbe balance are problematic, at least in this small sample set (spoiler alert - so far this isn't the case). 60 gal headed in a lambic-inspired direction (R). This batch was brewed with 39% unmalted wheat and hopped at a rate of about 225 g/HL (0.30 oz/gal). It was split into 4 carboys, with 2 of them going into a 60 gallon barrel that I share with some other great homebrewing friends. This barrel started with a saison with brett and lacto and we taking a solera-type approach and encouraging it to move in a lambic-inspired direction. The barrel is tasting quite nice so far and I am excited to incorporate the next pull (planned for early October) into blending as it will provide some of what I am generally short on so far - oak and fruit. The 2 carboys I kept were pitched with some combination of ECY 20, the yeast cake from previous beers, and bottle dregs. Tasting: At this point there is nothing drastically unpleasant about these but at the same time they are not my favorites from the aged beers. They are pretty mellow and overall understated, which makes them currently better than the highly phenolic beers, but there is a bit of a character I am not too keen on. It is something I have noted in certain commercial lambics before, and that a friend describes as a bit 'pool water-y', which I think is quite apt (though it makes it sound worse than it actually is). This could be related to chloramines/chlorines (I carbon filter my water and did the same process with the same filter cartridge for other aged and non-aged beers that aren't showing that character) or it could be something picked up in cooling, or something else. Anyway, my beers are not anywhere near this intensity, but they have hints of something that remind me of this. Otherwise they are pretty mellow and muted compared to both older and younger batches. I don't really know why this is. The bitterness and phenolic levels are lower and there is a mellow and pleasant sweet fruityness. Overall I think these beers are on a good track, especially as most of my other beers are higher in the phenolics and lower in the fruit, but they need more time to develop a more full character of their own. The Sept 2015 Spontaneous Starters carboy. September 2015 brew: If warm weather was going to be a problem, this would definitely show it. This beer (~50 L) was brewed with 27 % unmalted wheat and hopped at a rate of about 370 g/HL (0.49 oz/gal). The temperature of the wort in the morning was 19 C / 66 F so the cooling was certainly sufficient. I didn't note nighttime lows, but I suspect it was in the 10-15 C range given that final temperature of the wort the morning after cooling. The beer was split into three carboys with one receiving spontaneous starters, microbes from a bit of the trub of my favorite batches from my previous blending, and the third one receiving dregs from various mixed-culture saisons. Tasting and Blending Plans: The spontaneous starters batch is fairly high on the bitterness so this will get at least another winter before it is used. The batch with previous blend microbes has a good fruityness and is on a really nice track but is a bit more bitter than I'd like so this will probably get more time. Though it is possible that I'd pull it as a phenolic component in a blend with a more fruit forward base. Overall though I am happy to let these beers sit a bit more as they are fairly young yet (just under 12 months). The saison dregs carboy has a high lactic acidity and not much phenolic character. This beer may head toward blending with cleaner saisons to create something in line with blending an acidic old beer with fresh young beer. Older Turbid Mashed beers: These are left over from previous blending of aged mixed-culture beers (the same blending post was linked earlier in this article too). Muse #1: I have three gallons of this beer left over from my previous blending (there are some more details on it in that post, linked above). The beer was brewed in January 2013 and at the time of the previous blending it wasn't one of the best. It was a bit more acetic but had a pleasant fruityness. I prefer very low to no acetic acid, so this wasn't my ideal. But it certainly wasn't out of line with what you would find in many well regarded commercial beers so we're definitely not talking extreme levels. Just more than I wanted. This is generally still the case. In the new company of beers that are generally more bitter and less fruity than I want in a final blend (and with a clean acidity), this beer could be very useful for blending. Wild Rye: I also have 3 gallons of this beer left from the previous blending session. This was brewed in July 2013. During the previous blending it also wasn't one of my favorites as I thought it was too phenolic. Since then my taste preferences have shifted a bit (toward more phenolic) and the beer has developed/mellowed more. At this point I find the phenolic level is low-moderate and pleasant. As a bit of an aside, I need to do a side by side tasting of my previous blending, but my feeling from individual tastings over the past few months is that Blend 2 (the only non-fruited blend with this beer as a component) is my favorite. And I think part of that is due to this beer. With the more balanced and developed character I think this beer will also be a good candidate for blending. Sour Saison: the term sour saison is not one I am super fond of but for internal consistency I'll continue using this name for this beer while it is around. It is not saison-like and I wouldn't present it as one, but this was brewed mostly as a saison (not turbid mashed, not aged hops, pitched with saison yeast) while knowing it was going to head in another direction (it was open cooled and also pitched with lambic dregs). I liked this beer in the previous blending but it worked out that I had a gallon left over so I saved that. I was probably going to blend it with something younger and clean, but now that I have the 'saison dregs' carboy this may go into the other mixed culture beers. And that's fine with me as that is more closely what it tastes like. The beer has a higher acidity with a citric and light apricot-like stonefruit character. There is a bit of acetic which has developed since transferring and in storage so it is good that this will only be a small component of a blend, where that acetic will be at an appropriately low level. Common themes with my beers: One of the common themes in my beers is that I am missing the contribution of oak (at least the beers that didn't come from wine barrels). Some beers have been on a very small amount of oak cubes - usually soaked in boiling water to soften the more aggressive tannin character - but not high enough levels. I should note that while I am only saying oak, I don't necessarily mean an obvious oak flavor. And I certainly don't mean a bright tannic/more 'raw' oakyness (obviously they are toasted so not actual raw oak). But an older/more used oak can add softness and a bit of a smooth/mellowing/almost sweet contribution. And also some structure to aid the body of the beers. So that is more what I am looking for - the influence of a well used oak in mellowing flavor and structure. Low levels of oak (soaked multiple times in boiling water, and sometimes not first use) have now been added to all the carboys. The other main common theme is a bitterness across most of the beers brewed between 2014 and 2015 (where I had been living in the same place, and which was a different place from the beers brewed in 2013). This shows up regardless of hopping rate, which microbes were (or weren't) pitched, and across different seasons. The one common thread is that they were all opened cooled at the same place. After tasting the first couple beers I associated it with hopping rate but I am inclined to think that this isn't the case as I finished tasting through all the beers and noted that the bitterness can vary significantly in different carboys from the same batch. So I think this is microbe derived, and may have to do with microbe balance (note that brett pitching rate may not have much influence on brett flavor development) and/or other microbes promoting or reducing the phenolic bitterness produced by one/some. 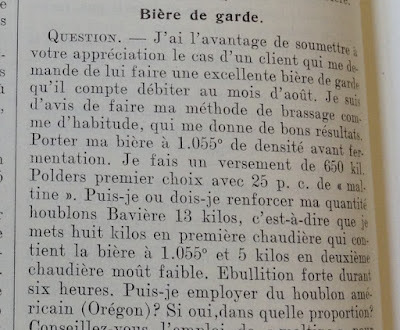 As I mentioned above, commercial brewers of spontaneous beers note that they can have rather phenolc younger beers and they can be almost undrinkable before aging into the end product that they are looking for. So for now I'm not too worried about this and I'll let them age for a bit to see if it ages out. Edit: Thanks to Dan at MTF for reminding me about a great old MTF thread regarding the same sort of (presumed) phenolic brett-derived bitterness that I am noticing in my beers. Carboys in storage while I was away. Fruit forward - Many of my beers weren't as fruit-forward as I'd like. I find that North American sours can be too fruit-forward for my taste and lacking some of the complexity that I love in lambic so I'm glad they weren't all super fruity, but I would like a fruit forward component or two to blend in with my beers that are, at least at this point, more phenolic. So I may try to come up with a blend of dregs/cultures for a future brew that I think will promote more fruityness in one or two carboys for use in blending. New ambient microbes - I'm now living in a new location with different conditions so I'm interested to see what the microbes around here are like. My new place is a bit drier and more exposed rather than the more wooded valley conditions of my previous place. There are also fruit trees in the back yard compared to old oaks where I was living before. Given how variable different lambic microbes are in the relatively small region of traditional lambic production, I expect to see some fair differences in my current location compared to my previous. So I'll probably put out some more spontaneous starters to see what is around here and I am also looking forward to trying some fully spontaneous beers as the weather cools. Fruit - I have some fruit from this year's fruit season frozen and waiting for aging on some beers. So when I do a more detailed tasting of the beers that I think may be ready for blending and try some blends I will pay attention to how the fruits I have may compliment them. I've got sour cherries, apricots and rhubarb (I know it's not a fruit but it is fruit-like in flavor contribution). I am already thinking that the apricots could be a nice addition to a blend with the sour saison in it given the light apricot/stonefruit character of that beer. Finally I plan to re-try at the Rodenbach Vin de Céréale-inspired brew. I'll probably change the malt bill to a paler base with some higher color malt and may try to get it on used oak earlier in the process. Otherwise I expect I'll carry on as normal with these mixed-culture beers. For hopping I think I'll stick with around 500 g/HL (~0.67 oz/gal) for now. The lower hopped beers were ones that I didn't like as much and I didn't notice any clear problems from higher hopping. I'll probably re-brew the rye base that I still have a bit of around and maybe something darker like a duivelsbier but otherwise keep it pretty close to the classic lambic tradition. Though I'm not calling my brews lambics (and mostly so far they are not spontaneous), that is the sort of final end product I am looking for in terms of balance, complexity, and general flavor/aroma characteristics. This write up and tasting has somewhat critical but that is because I want to keep a high standard for my target end result and I don't want to settle for something that is only good. The beers are all in the direction I am looking for, so with more time, some minor tweaking, and a greater diversity of components I think I am on track to create what I want. Ok, that's plenty for one post. If you want more details on recipes of certain components and/or how some are tasting feel free to ask! There was already so much in this post that I didn't want to expand it further but I'm happy to share it.